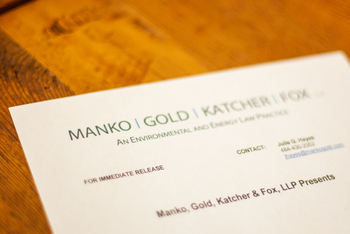 Manko, Gold, Katcher & Fox, LLP (MGKF), the environmental, energy and land use law and litigation firm, located just outside of Philadelphia is proud to participate in the ALISS (American Legal Industry Sustainability Standard) pilot launch of the Law Firm Sustainability Network. ALISS is an online assessment tool designed to help law firms measure the success of their environmental sustainability programs and discover opportunities to improve their sustainability programs. See press release here.